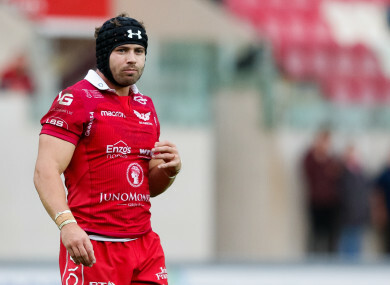 The Scarlets fullback has not played since Wales’ Autumn Test win over Australia. Halfpenny won't be involved on Friday night. SCARLETS HEAD COACH Wayne Pivac has confirmed Leigh Halfpenny remains sidelined with the concussion he suffered during Wales’ November Test win over Australia last month. The fullback will miss Friday’s Heineken Champions Cup clash against Ulster at Parc y Scarlets [KO 7.45pm, BT Sport], as the Welsh region give him more time to fully recover. Halfpenny is still going through the return to play protocols after he was the subject of a contentious late tackle from Wallaby centre Samu Kerevi during the Test at the Principality Stadium. “Leigh’s been ruled out, we’re giving that a bit more time, just being on the safe side really with the back three we’ve got,” Pivac said. Scarlets are, however, hopeful of having second row Jake Ball available after he passed his Head Injury Assessment tests during last Saturday’s Pro14 defeat to Glasgow Warriors. “Jake’s hitting all his markers from an HIA point of view, so hopefully he keeps ticking those boxes, and there’s a slot to fit him into,” Pivac added. Prop Samson Lee and flanker James Davies could return to action but Scotland-qualified Kiwi Blade Thomson has been given an extended break following a blow to the head he received against Edinburgh last month. The Welsh region are due to be boosted by the return of internationals Hadleigh Parkes, Gareth Davies and Ken Owens for the visit of Ulster in round three. Scarlets currently sit bottom of Pool 4 with just one point following opening round defeats to Racing 92 and Leicester Tigers. Email “'Just being on the safe side': Halfpenny out of Ulster clash due to concussion”. Feedback on “'Just being on the safe side': Halfpenny out of Ulster clash due to concussion”.